Hussein Bazaza F/W 2016-2017 fashion show "Sophia The Goddess" took place July 9th in Rome for ALTAROMA July 2016 edition. On July 9th I attended Hussein Bazaza's fashion show and I can certainly say that it was one of the best collections of this ALTAROMA edition. "Sophia The Goddes" collection is inspired by the story Sophia The Alchemist, that tells the story of the research for immortality and this is why the entire collection is clustered both with geometric symbols and natural symbols, such as stars, butterflies and unicorns. 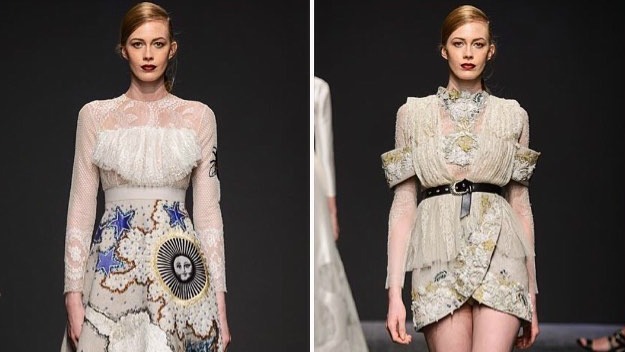 All the creations are also embroidered with lace, stones and patterns, creating an unique and elegant effect. Great post, I love the dresses. davvero bellissima questa collezione...non lo sapevo che e ispirate di un libro....molto interessante! adoro leggere, devo cerarlo! Gorgeous selection, so many beautiful pieces to lust over!